Every lens has a focal point, where all the light directed at that lens converges or diverges and the distance between the lens and that point is called the focal length. The eye normally focuses on the image on the retina. This is because the convex lens inside the eye can become wider or narrower to compress the light. Sometimes, however, something inside the eye is not functioning correctly. This makes the visualization blurry or mixed up. I am going to identify these disorders and how lenses correct them. Myopia also known as nearsightedness is one of the defects of the eye. A person who is suffering from this disease only see objects that is near to the eye clearly. This means you cannot see objects at a distance which appeared to be blurred. If the eye has myopia the eye is too long and the image falls short of the retina when the target object is far away. The image shows that in myopia the image fall short of the retina when the target object is far away. 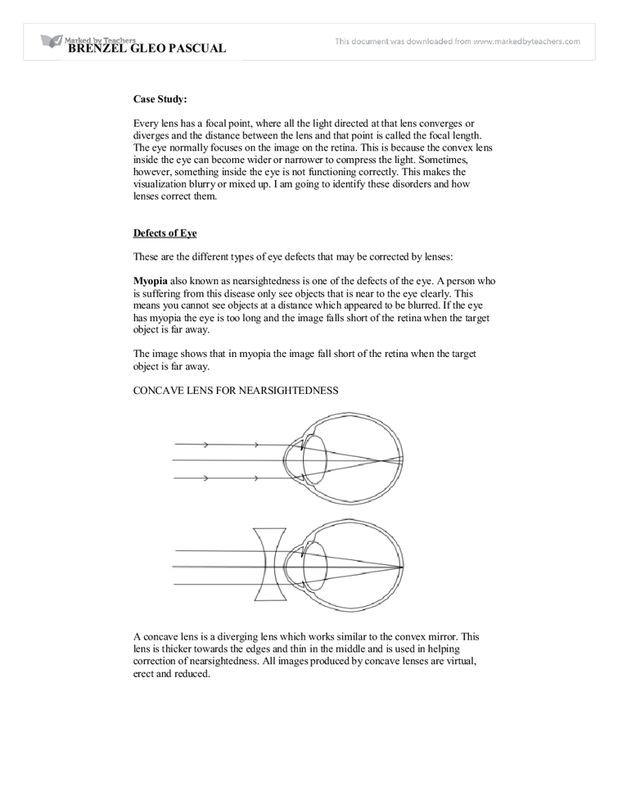 A concave lens is a diverging lens which works similar to the convex mirror. This lens is thicker towards the edges and thin in the middle and is used in helping correction of nearsightedness. All images produced by concave lenses are virtual, erect and reduced. Hypermetropia also known as hyperopia or farsightedness is another type of eye defects. Hyperopia is the opposite of myopia means that a person who is suffering from this disease able to see objects far from the eye visibly. In this case the eye is shorter than normal and the image focuses behind the retina this means it doesn’t focus even when it reaches retina. The images focus at the back of the retina. A convex lens is a converging lens which works much like a concave mirror. This kind of lens is thicker in the middle and thinner towards the edges, like the lens in a magnifying glass. The image is changed by the position of the object in relation to the focal length and the radius of curvature. This lens helps people who are suffering from farsightedness. In this equation the term f is a permanent number, called the focal length of the lens. It tells everything about the lens itself, including the material it is made from and the curvature of the surfaces. Checking people’s health is very important. 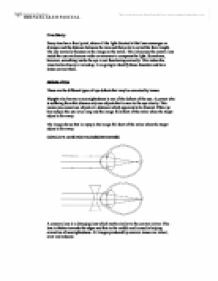 Each defects of eye has different needs of lens with different focal length or point. Ensuring that people can see as well as possible is a very useful contribution to their health. By correcting the lens of an eye people will able to see clearly vision. It is not always possible to balance red and purple vision, as red light has different wavelength, different wave speed in different mediums and different refractive index than the green light. This student written piece of work is one of many that can be found in our AS and A Level Microscopes & Lenses section. My experiments focus is to obtain an accurate measurement for a specific lenss power. To investigate the relationship between u and v for a convex lens. 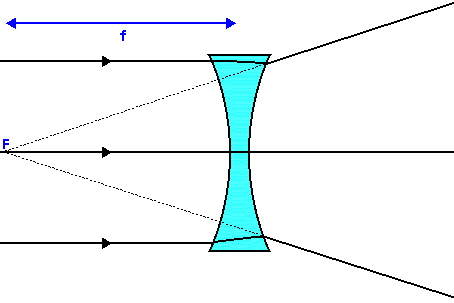 The focal length of a convex lens. Does the focal length of a lens depend on the colour of light used? The second preliminary investigation done was to find the focal length of the lens chosen. METHOD To find the focal length of the lens chosen, we shall use a equation. This is done firstly by taking some measurements. First of all we shall take the object distance as 30.0cm. The image occurs behind you, (c) The pin is not along the principal axis of the lens, (d) The lens and the mirror are not parallel. In experiment 3, the lens must be placed vertically. In using the no-parallax method, you shouldn't only move your eyes, but also your head. times greater than the focal length of the lens, the image will be diminished. The value for v will be greater than the focal length of the lens, but not greater than two times the focal length of the lens. However you can have eyes that have certain defects. There are two main problems with eyes. Firstly myopia (more commonly known as short sight) this is when a human can see objects that are closer to them better than objects which are further away.